From an investor’s perspective, planned transparency is far preferable to surprise leaks or investigations into corporate tax avoidance strategies which lead to reputational risk and government crackdown, writes Morris Pearl. Morris Pearl is a former managing director at BlackRock Inc. and the chairman of Patriotic Millionaires, a group of wealthy Americans who are committed to building a more prosperous, stable and inclusive nation. Next Monday (12 June), the European Parliament will be considering an important proposal to increase the disclosures of tax information of multinational companies. As an investor personally, and one who has been trusted to invest other people’s money over many years, I want to speak out strongly in favor of the European Union’s efforts. And although I am a US citizen living in New York City, I offer my opinion here to reinforce the global import to our financial markets. Despite rising nationalism both here in the US and in Europe, we live in an economy where money moves easily, country to country, without a visa or passport. The rules of finance are increasingly borderless and information is ever-more necessary to the management of sovereign economies. In this environment, tax transparency rules are a critical first step. Public officials need to make informed policy decisions and the public must understand the rationale behind those decisions. And, speaking from personal experience, investors need information to make informed decisions about risks associated with multinational companies. Years ago, when I first started in finance, the use of offshore tax havens was limited. The practice itself dates further back, but the number of companies and the amounts of money were of little consequence to the global economy. That is no longer true. US-based multinational companies alone hold €2.3 trillion offshore – roughly equal to the GDP of France or the United Kingdom. These companies owe approximately €680 billion in taxes and experts estimate an additional €120 billion is lost each year to aggressive use of tax havens. Profit shifting to avoid taxation is now common among the largest multinational companies, with damaging results. Lost revenue from aggressive corporate tax avoidance strips resources from public services and destabilises economies. Individuals and small and domestic businesses are left to either cover the difference, or lose government services. Europe and the US are now wrestling with difficult but avoidable decisions. 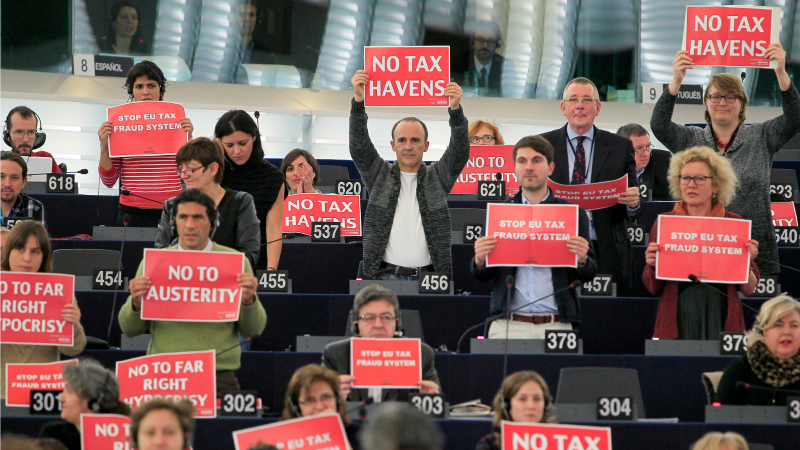 Austerity movements fueled by tax haven abuse have undermined the ability of governments to respond to both economic and non-economic challenges. For investors, the threats are twofold. Less stable and rapidly changing economies heighten risk. Additionally, we see a crackdown on aggressive tax avoidance schemes revealing massive previously undisclosed tax liabilities. The case against Apple’s special tax deal with Ireland, the raid by French tax authorities on Google’s Paris offices, an investigation into Starbucks, and others are warnings to investors to consider tax strategies when making decisions. In the US there was a dispute that led to litigation over the sale of Dell, the computer company, in which experts estimating a fair sale price came up with competing amounts that differed by €23 billion based largely on the disagreement over tax liability from profits booked offshore. These are the tangible consequences to secrecy for investors. Some people have suggested that the solution is to double down on secrecy, a strategy that relies on the notion that what is not known, will not be regulated. That seems neither practical nor realistic. The little information that is known is reported. Estimates are made by researchers, analysts, and the media and worst case scenarios are assumed. From an investor’s perspective, planned transparency is far preferable to surprise leaks or investigations that lead to reputational risk and government action. Fortunately, the trend is toward tax transparency. The Organisation for Economic Cooperation and Development (OECD) has already agreed to standards that require companies to report to tax authorities certain information on a country by country basis. While helpful, the secrecy around tax authority information offers little to legislators, the public, or investors, all of whom need the information. It does, however, suggest that it can be done without debilitating costs. There are proposals in the US that would create new, public, country-by-country reporting standards, but the process is slow and uncertain. The European Union has an opportunity to help lead and set the standards for the world. As one who has watched changes to the financial system over many years – some for the good and others bad – I would urge Europe to take the opportunity to lead this change for the good.